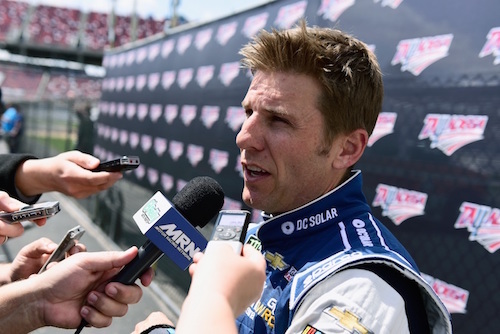 Monster Energy NASCAR Cup Series team owner Chip Ganassi confirmed to The Associated Press on Monday at Indianapolis Motor Speedway, that Jamie McMurray would not be a full-time driver with the team beyond the 2018 NASCAR season. Ganassi, though, has offered McMurray a deal for next year that includes an entry in the season-opening Daytona 500 and a possibility of other races, in addition to a leadership role with Chip Ganassi Racing. McMurray has refused opportunities to comment on his racing future. According to Ganassi, the driver hasn’t decided whether or not he’ll take the deal or look for a full-time driving opportunity with another team. Dario Franchitti moved into an administrative role with Chip Ganassi Racing after a retirement from racing in the Verizon IndyCar Series. According to several published reports, Kurt Busch will replace McMurray as a full-time driver at CGR next year, making him a teammate to Kyle Larson. Ganassi has refused to comment on a possible Busch hiring, and Busch claims that he has spoken with two teams but doesn’t have an official deal, yet. McMurray has had two stints as a Chip Ganassi Racing driver, the first going from the final six races of the 2002 season through 2005. After a move to Roush Fenway Racing, the driver returned to CGR in 2010. Hi claimed his first win at Charlotte (N.C.) Motor Speedway in his second-career start while substituting for the injured Sterling Marlin. In all, he is a seven-time winner in the Cup Series, five of those with CGR. McMurray’s last Cup Series win came in 2013 at Talladega (Ala.) Superspeedway. McMurray has one top-five and six top-20 finishes through the 26-race 2018 regular season. he failed to make the playoffs that get underway Sunday at Las Vegas Motor Speedway.